Jake Levine's Electric Objects project on Kickstarter just raised $787,612 on a $25,000 goal. 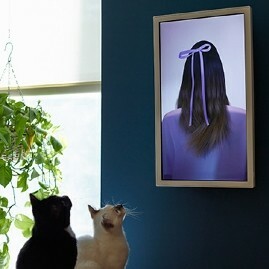 The integrated computer and framed screen is designed to showcase art and other images and videos from the Internet the way a canvas might - on your wall. Electric Objects has an artist in residence program and a developer SDK which will be of interest to the LISA community. Jake was previously General Manager of Digg at betaworks, trying to understand and improve the ways that people find, read and talk about news stories. While working on News.me, Jake co-created Last Great Thing with @jvanslem. Another of Jake's creations is BreakupText, an app that allows you to end things with just a few clicks.